Ravi Shastri was a wonderful servant of Indian cricket for over a decade. He was a serviceable and determined middle-order batsman, a valuable left-arm spinner and a long time vice-captain to numerous captains. Tall and good-looking, Ravi was something of a poster-child for Indian cricket. Many argued that he batted too slowly, was selfish in his approach, and only held his place in the team because Sunil Gavaskar was the captain. Shastri was one to let his performances do the talking. Shastri admitted himself that his accomplishments were only due to hard work rather than talent. Not a graceful stroke-maker, Shastri accrued runs by prodding away defensively and leaving the deliveries that were beyond him. Of batsman who have played more than ten Test innings against Australia, only Eddie Paynter has a better average than Shastri’s 77.75. 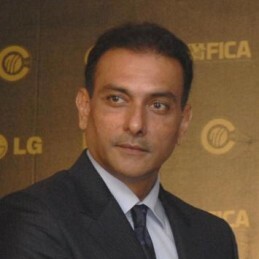 Despite his defensive nature, Shastri could hit when it he was needed to. In a Ranji Trophy game in 1985, Shastri equaled Sir Garfield Sobers record of six sixes in an over. Although he had his detractors, few would argue his worth to the team. His dedication, consistency and will was admired by his team mates and commentators. Shastri played his last Test at just 30 years of age. He went on to become a successful cricket broadcast commentator, calling play around the world. He is also a popular and humorous speaker.